So in-between working and normal life I will get some up dates and wips in, until next time. Last edited by Mike Mee on Tue Dec 13, 2016 3:32 am, edited 2 times in total. Ok, so I'm back. Got some time off work to show the first stage of the Shaltari. 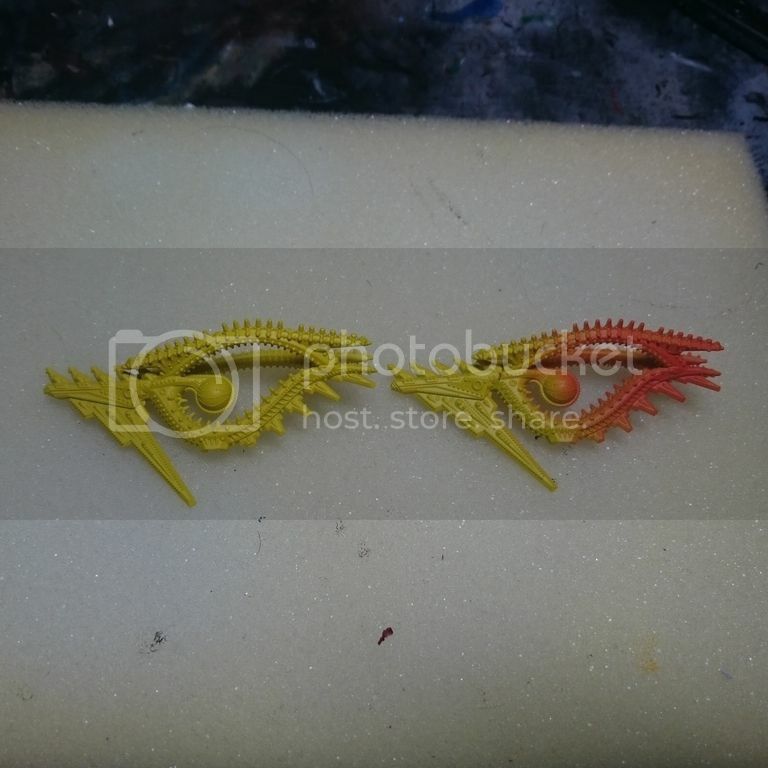 Nothing special, the first stage is exactly like the studio DZC Shaltari, assemble model, spray model Tamiya fine white spray then spray the f***er yellow! Model Air medium yellow to be exact. 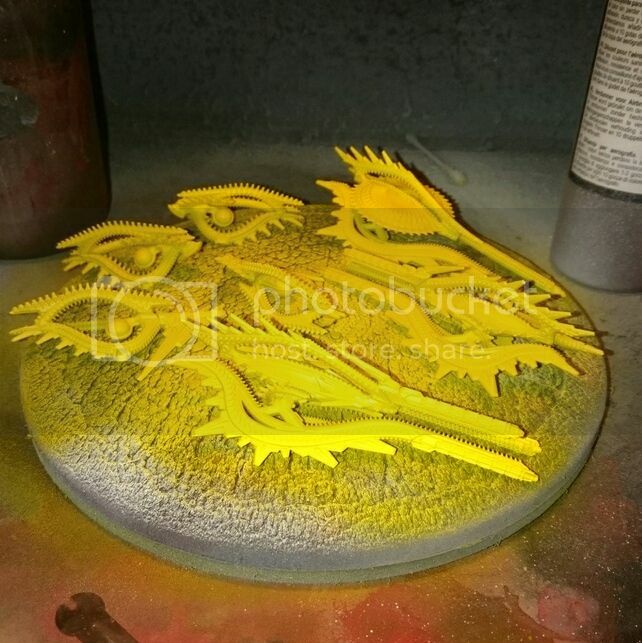 It's important if you are airbrushing to do it in several thin coats to get a nice consistent yellow all over the model. 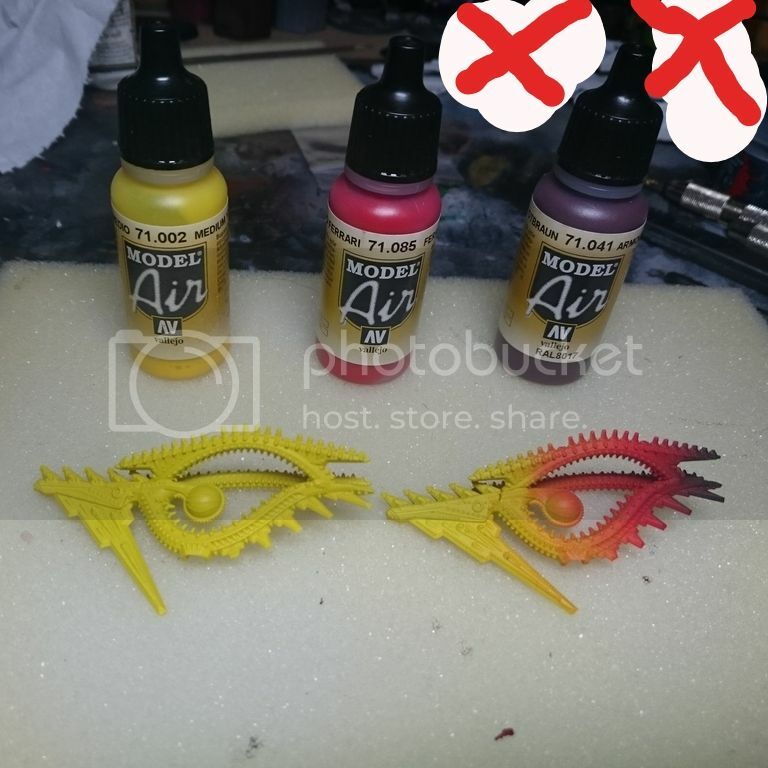 You may see in the next step that you don't need to spray the entire model yellow, but I think it will help getting correct coverage down first before applying any other colours. Going to be doing magnets and building models tonight as I don't have the other colours yet, I'll get another update soon. Yellow. Bold choice, I wish you luck ! Abrusio wrote: Yellow. Bold choice, I wish you luck ! Cheers dude, I've been a bit more productive tonight. J.D. Welch wrote: Yes, they are YELLOW! What you mean more, that's it now. So I got my paints tonight, plus loads that I didn't need. I swear I have bought 14 new paints in the space of a week and a half(I'm turning into Martin) Anyway, next is the other airbrush stages, as I mentioned before you need to have your yellow base coat nice and solid. Now as I have just found out, you need to take great care applying the coat of red spray over the model. 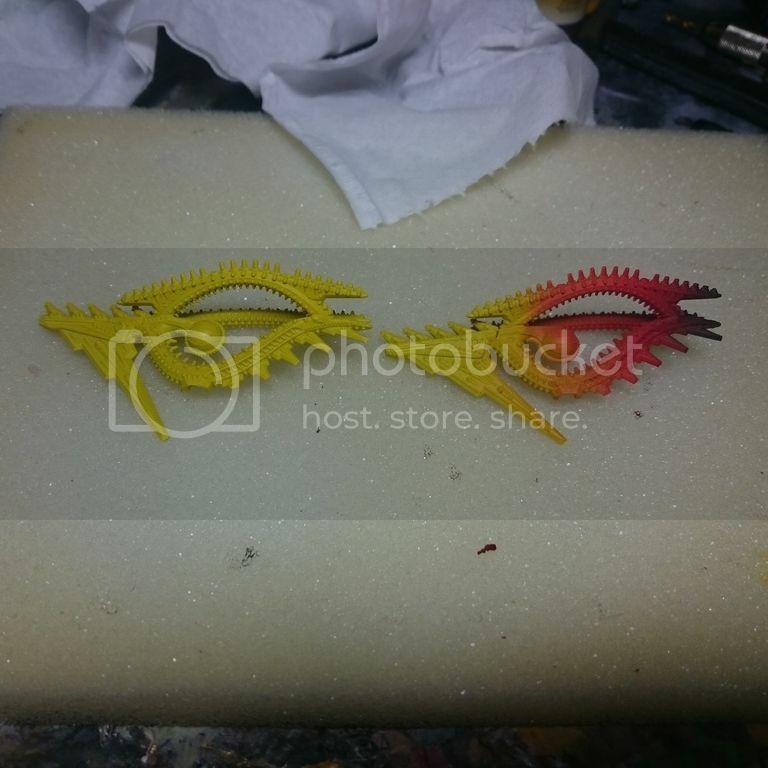 It is so much easier applying red over yellow than the other way around, as I found out to my own cost. With Gary's advice, here is the general jist of these stages and paints used. 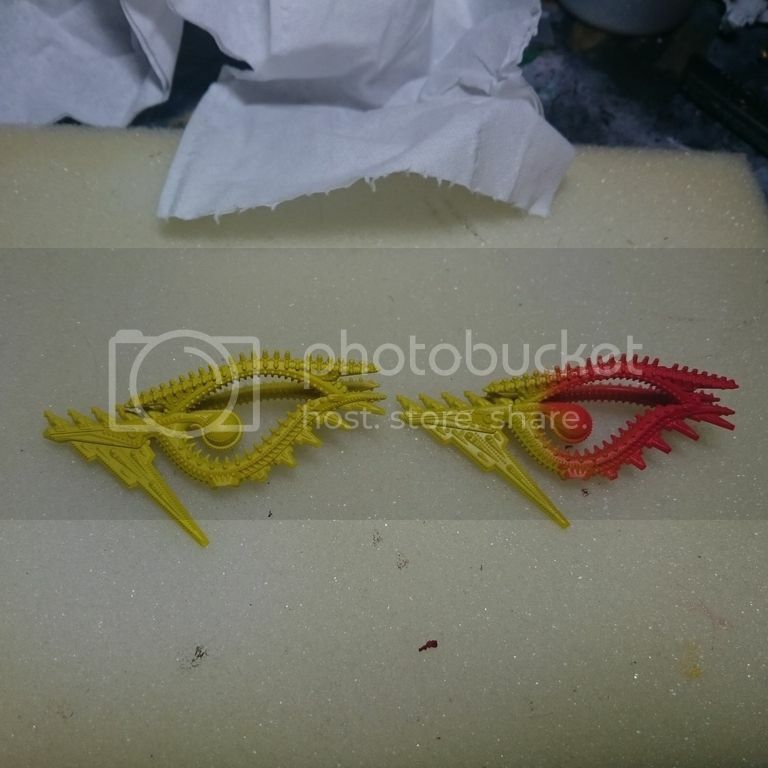 The first stage is a light airbrush of Ferrari red over the rear half of the ship in question, in this case, a frigate of some random class the aim of this stage is to try and get a gradual fade between yellow and red, the aim is to have a nice looking orange between the red and yellow. So that nice orange fade I was talking about, well no one is perfect but this is the best I could manage without being an airbrush wizard like Gary. Saying that, I'm happy with my first try which I will perfect over more models. 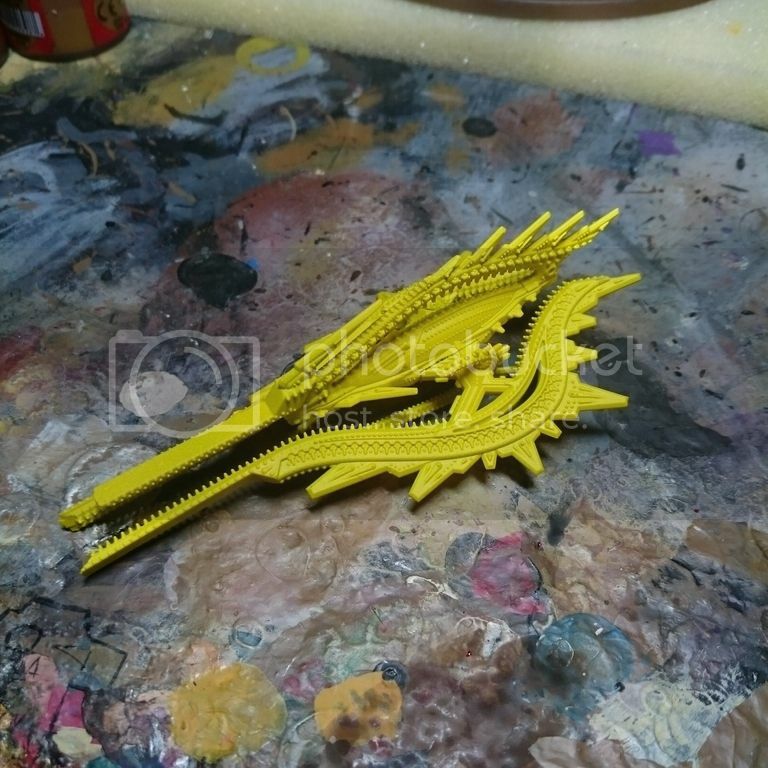 I actually made a few touch ups on this model with some of the yellow. The final airbrush stage is a dark brown, I will provide the colours at the end, on the tips of the ships. I went a bit over zealous on this stage and I'll be cutting back on it a bit on the next model. And the paints with the models, regarding the red, you have a choice of colours to use. Either the red I went for Ferrari red or Fiery red I think it's called. Gary said it's personal choice with these, I chose the Ferrari red as it was a warmer shade of red. Hope you found this helpful and not a massed jumble of words, next stage coming up soon.